Job losses are increasing, but that hasn’t stopped Americans from spending and unfortunately that pretty much sums up American culture. Retail sales increased 1 percent in the month of January despite a sharp increased in jobless claims (Instant Insight on Retail Sales). Consumers took advantage of sharp January discounts and the bankruptcy of Circuit City. This pace of spending cannot be sustained and skepticism towards future spending has driven the EUR/USD below 1.28. 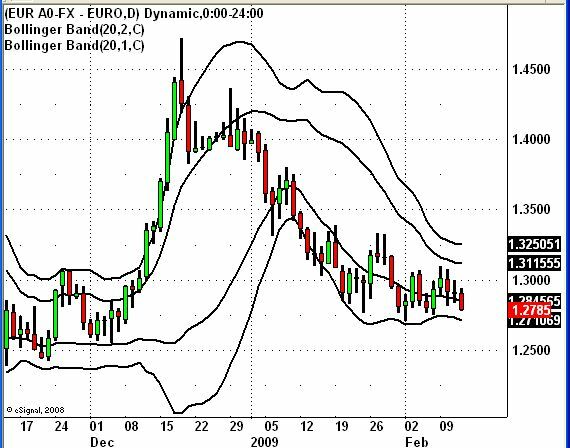 According to our technical analyst at FX360, intraday EUR/USD support is at 1.2785. Also, here is why retail sales is increasing! 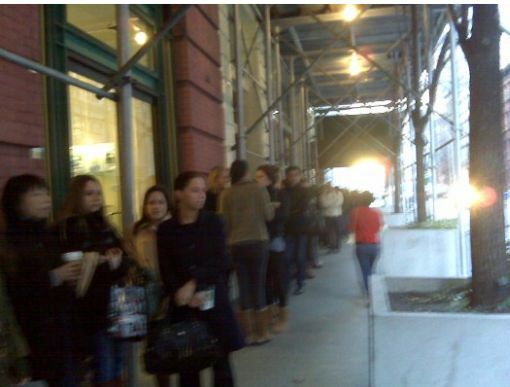 This was the line at the Barney’s Warehouse Sale this morning in NY. At 7:11am, 50 people were on line and by 8, the line was down the block and around the corner. Luxury discounters are cutting prices significantly and if these people are lining up to shop today, it leads me to wonder, do they have a job? US Dollar Forecast: What’s In Store for 2009? 2008 Price Action: It has been an exceptionally active year in the foreign exchange market as currency volatilities hit record highs. In the first half of the year, everyone was worried about how much further the dollar would fall but in the second half of the year the concern became how much further the dollar would rise. More specifically, after hitting a record low against the Euro in the second quarter, the US dollar surged to a 2 year high against the currency in the beginning of the fourth quarter. From trough to peak, the dollar index rose more than 23 percent in 2008. 3 Themes for 2009: The US economy and the dollar’s fate in the years ahead could be determined by what happens in 2009. We are focusing on 3 big themes that will impact the US dollar and each of these themes encompasses a lot. 1. U or L Shaped Recovery: The US is in recession and the slowdown is expected to deepen in 2009. Before a recovery is even possible, the economy has to work through more weakness and negative surprises. Non-farm payrolls declined by 533k in November, sending the unemployment rate to a 15 year high of 6.7 percent. With many US corporations forced to tighten their belts, the unemployment rate could rise as high as 8 percent. We expect this to happen because over the past 50 years on average, recessions have boosted the unemployment rate by 2.8 percent. When the current recession started in December, the unemployment rate was 5.0 percent. If you tack on 2.8 percent, that would drive the unemployment rate to at least 7.8 percent. Therefore non-farm payrolls could double dip, just as it has in past recessions. In this case, we would expect a rebound followed by another sharp loss that rivals November’s job cuts. A rise in unemployment spreads into incomes, spending and then usually leads to more layoffs. We need to see this toxic cycle end before we can see a recovery. Consumer spending has already been very weak and the trade deficit is widening as the dollar strengthens. As the 2 primary inputs into GDP, we expect fourth quarter growth to be very weak. The strength of the US dollar in Q3 and for most of Q4 will also take a big bite out of corporate earnings, leading to disappointments for the stock market. 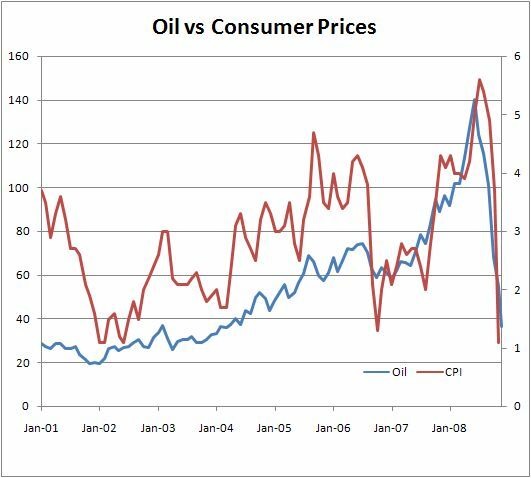 This is why we expect more weakness in the US dollar and the US economy in the first quarter of 2009. However towards the middle of the second quarter, we may begin to see the US economy stabilize as it starts to reap the benefits of Quantitative Easing and President Barack Obama’s fiscal stimulus plan. New Administrations usually hit the ground running and as such we fully expect the rest of the TARP funds to be tapped shortly after his inauguration. The shape of the US recovery will have a big impact on the price action of the US dollar and the path to a stronger dollar will be through a weaker one. 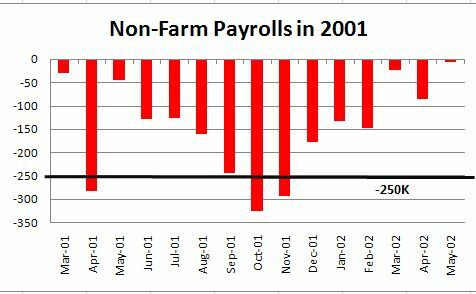 The following chart illustrates the double-dip trend of non-farm payrolls during the 2001 recession.